Our Two-Tailed Swallowtail (Papilio multicaudata) chrysalises have arrived from an Arizona breeder. 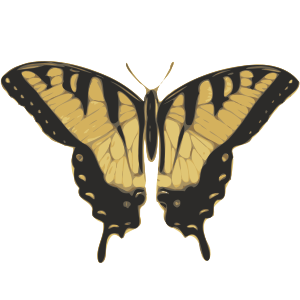 It is unfortunate that the majestic Two-Tailed Swallowtail (Papilio multicaudata), our largest butterfly (possibly the largest in all of North America in terms of both mass and wing span), is so incredibly rare in its Northern California range. Populations don't even exist in Albany, suburban or natural. Many enthusiasts can't even witness one personally in their entire life. So our solution? Well, we went ahead and got six of them from an Arizona breeder who presumably sourced them from the wild population as they are fairly common in parts of Arizona. Two of them emerged and perished in transit, one male who had been dead for at least a day and a female that must of emerged only today but was obviously not going to make it with such crippled wings. The other four were in great condition, shown below. For those who may have seen these before, this may sound inexperienced, but we almost jumped at the enormous size! Of course we knew they were big, but they are truly amazing (they look like logs!). They tower over our Eastern Tiger Swallowtails (Papilio glaucus) and of course our Western Tiger Swallowtails (Papilio rutulus), Anise Swallowtails (Papilio zelicaon), and Pipevine Swallowtails (Battus philenor hirsuta) which we also have on hand right now; they are the larger than any other glaucus group swallowtail, even the huge Appalachian Swallowtail (Papilio appalachiensis). After weighing, the largest of the four came up as 2.9 grams, which is at least twice as big as any of the other species and probably three times as smaller individuals. 2.9 grams is respectable even among moths which can get much heavier than butterflies and we're sure that this probably isn't even close to a record-breaking weight. Putting our Eastern Tigers next to them is certainly embarrassing (bottom right)! If we get past this first step, which is completely based on luck at this point, the second step is to hand-pair. This shouldn't be terribly difficult considering that they must have massive genitalia (ha-ha). Step three will be finding a suitable host plant to elicit ovipositing of the gravid female, preferably hop (Ptelea) or ash (Fraxinus), but we have yet to discover either growing in our area so we will probably have to resort to a nursery. The last step -- setting up a proper enclosure and getting the female to actually lay -- is considerably difficult; we're not even sure if we have done it correctly for our gravid Eastern Tiger females right now (they have not laid a thing yet). Failing at any of these four steps will stop us in our hopes of ever obtaining a whole lot of big (6 grams?) green snakes (caterpillars)!